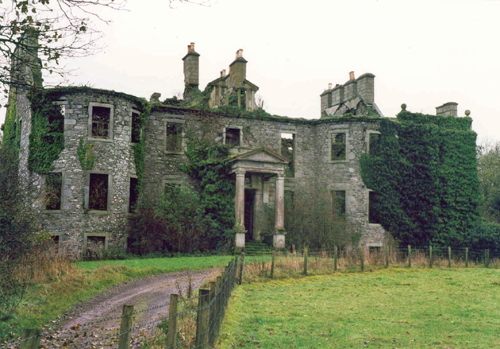 In the early hours of October 23rd 1941 a blaze began in one of the bedrooms of Barnbarroch House, Wigtownshire. Servants, woken by the noise, raised the alarm. Some jumped from windows, seriously injuring themselves whilst others used ropes to climb from the building. In spite of the best efforts of local farmers the wife of the owner, Mrs Ada Vans Agnew, perished in the flames. 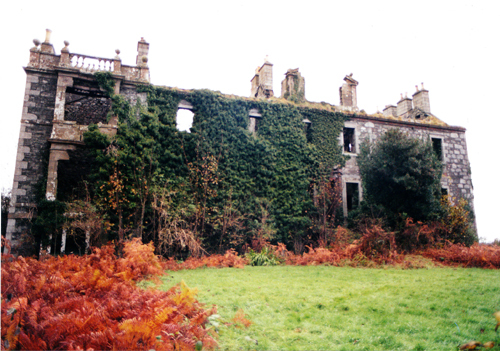 The house has remained a ruin ever since. Once again, one might ask how could I have been involved with a house that no longer existed as such. However, I have worked with surviving elements from a number of ruins notably Edwinsford and to a lesser degree Uppark. I have also been involved with buildings that have long since vanished, for example, Carlton House. Many years ago I was alerted to a very rare, perhaps unique, survival amongst the papers relating to this building – a collection of hand-painted cards produced by a house-painter for a prospective client – Mr Robert Vans Agnew of Barnbarroch House. 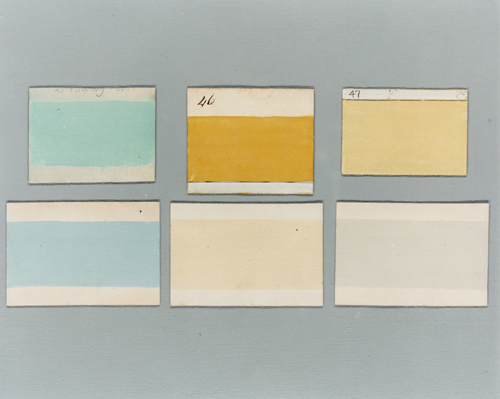 In effect, these were an early set of colour cards showing the sort of paint colours that were on offer. 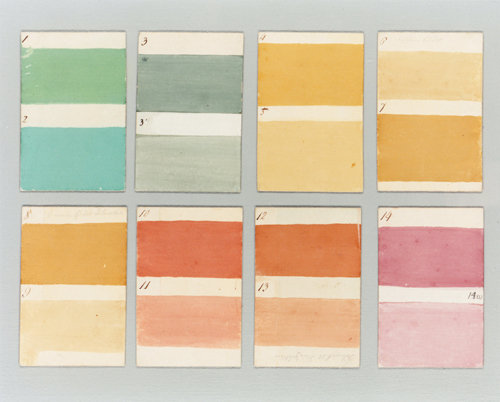 The remarkable thing about these cards is that they were made in 1807 and therefore the most accurate indication of genuine ‘historical colours’ – certainly those of the late Georgian / early Regency period. As the colours were applied in a distemper medium and stored in an envelope the colours are still remarkably fresh. I have written about these colours before – Paint Colours of the Past – and have reproduced them in modern paint but wanted to give a brief account of the house. 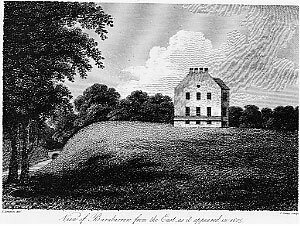 Barnbarroch was originally built in 1780 for the Vans Agnew family. 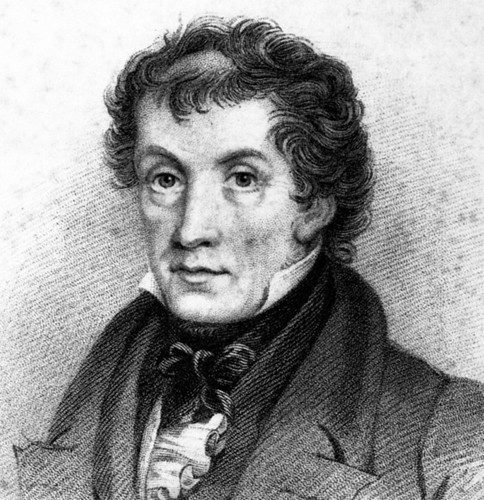 In about 1805 John Claudius Loudon was employed to remodel the house. Although primarily known as an architectural writer and landscape gardener Loudon did carry out a few architectural commissions early in his career. Amongst other things he added a west wing and pediments to the main door and attic windows. Loudon also laid out the grounds surrounding the house, which consisted of gravel pathways, winding amongst trees and smaller ponds with the ruins of an old building at the end of one of the pathways. A glass house was attached to the side and an ornamental staircase leading down to the gardens below was added. A collection of Loudon’s drawings and notes on his architectural recommendations for the house is held by the Oak Spring Garden Library*. The Library also contains an extensive collection of volumes authored by both Loudon and his wife, Jane Wells (1807-1858). “I believe that I am the first who has set out as a landscape gardener, professing to follow Mr Price’s principles. How far I shall succeed in executing my plans, and introducing more of the picturesque into improved places, time alone must determine”. Price advocated a threefold division – the garden immediately round the house to be formal, the garden beyond to be in the landscape style, and the park to be left to itself. Rather than imposing symmetry he argued for a less formal and more asymmetrical interpretation of nature. Barnbarroch House – Before Work. 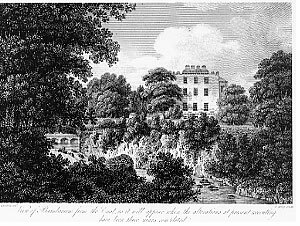 Loudon employed the Picturesque Style for a large number of commissions in his early years and published designs for numerous country residences, including Ditchley Park in Oxfordshire and Harewood House in Yorkshire. Barnbarroch is important as one of the few surviving examples of both his architectural and landscape work. We also know that of the 69 colours six were selected and these are shown above. We know where some of these colours were used, but not all. After seventy years little survives of the interior of Barnbarroch, but it is an intriguing thought that an analysis of fragments of plaster might be able to answer this question. *I am grateful to S.E. Gordon-Salway for providing me with this information. 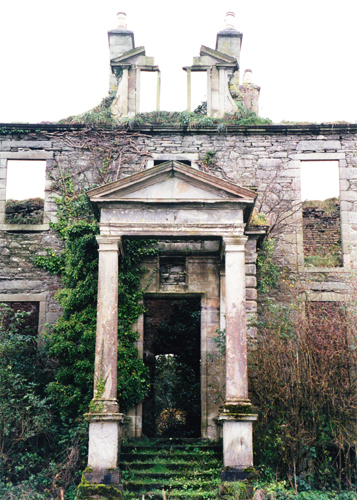 See the Buildings at Risk Register for Scotland. When I was last in the house (in 2005) there was still some plaster clinging to the west side of the entrance hall. Have you been able to analyze this? The doctor from Derbyshire who outbid me on the house started some remedial repair works but I don’t think they got very far. It would be a shame if the fragments of plaster were destroyed before they were tested. Thank you for that information. I was contacted by someone, who I gather had bought the house, and who was interested in help but have heard nothing since. My 3rd GGF, Alexander McKenzie, born 1815 was a gardener at Barnbarroch House in 1856. 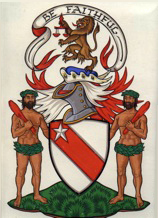 The statutory record of his son John McKenzie 1856 shows that John was born in the Barnbarroch Stables. The record states that Alexander McKenzie, Gardener Barnbarroch House. How wonderful to hear this. It’s this sort of information that really brings these houses alive.